Advance Tabco PRBD-24-24 Prestige Series Stainless Steel Beer Drainer - 24" x 25"
Take your drink and beer service to the next level with the innovative Advance Tabco PRBD-24-24 Prestige series stainless steel beer drainer. Items found within the Prestige series of underbar equipment line up perfectly with each other, creating a uniform look across any bar. In addition to a number of eye-catching features, this beer drainer boasts an exclusive twist-action leg assembly for added strength and an extended backsplash to create a truly one-of-a-kind unit. Multiple beer lines can be fixed behind the 3" x 6" rear column and matching 14 3/4" backsplash to provide your operation with a polished, professional look. 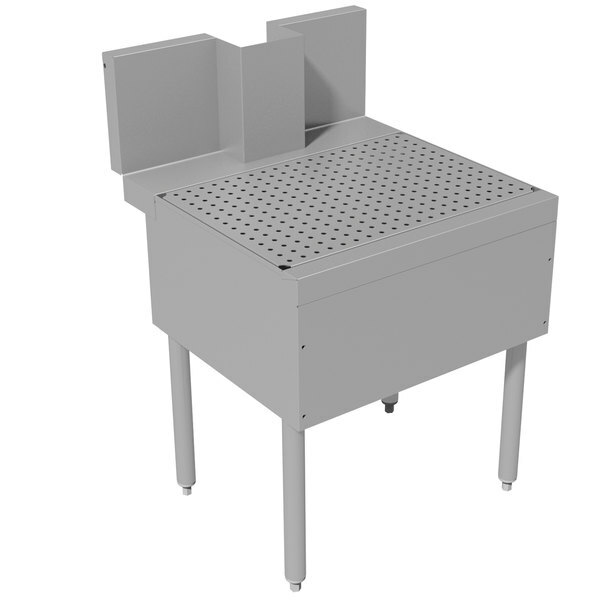 A removable perforated drainboard top is paired with a 1" IPS drain that's built into the unit for increased ease-of-use. The Advance Tabco PRBD-24-24 Prestige series beer drainer will serve as a welcome addition to your restaurant, bar, or commercial kitchen. Work Surface Height: 21 1/4"